At EGX this year, I went in the Leftfield Collection and I saw a shredder. 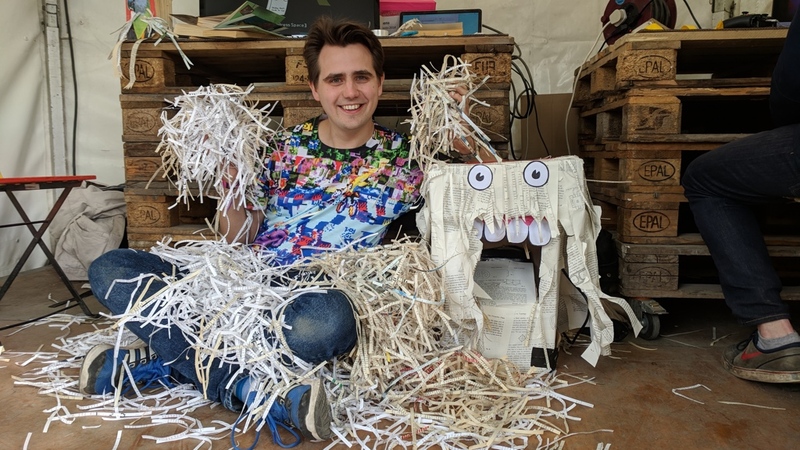 A paper shredder with a face, and a big pile of books next to it. And a big pile of shredded books underneath it, too. So I ambled over, eager to destroy some literature. 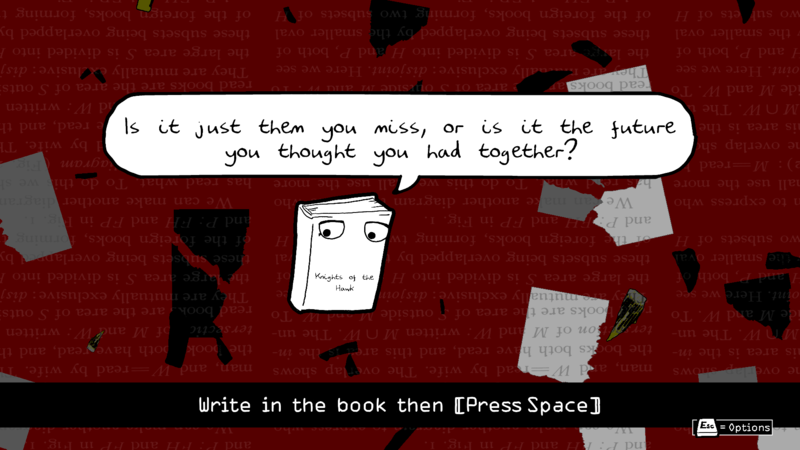 It was, it turned out, The Book Ritual, currently free on Itch. The Book Ritual is by Alistair Aitcheson. I did not know this when I sat down to play it. The identity of the developer is particularly relevant to me writing this, because I went to school with Alistair Aitcheson. Reader, I did not. But that’s okay. I remember Alistair. He was, I think, two years above me, but I was part of a social group that intersected with his. Alistair had much longer hair back then. Once he came to a fancy dress party as, I’m fairly sure, Super Ali, in a Superman style shirt over a t-shirt with a big A on it. We called him Ali A (I presume because of the existence of another Alistair, but I do not remember so much as a molecule of same). “I was really happy when you called me Ali A,” he said. “Nobody’s called me that in forever.” To be fair, it’s not a great name if you want to stand out in video games. It turns out that Ali spent the last decade beavering away making video games. Since launching a few iOS games, he’s “been working on progressively stranger games”, and more recently experimenting with what he calls “alternative-controller games”. Which explains the shredder. The Book Ritual has a framing narrative of sorts. You choose a physical book that you want to play it with. This book turns out to believe it’s actually a human that’s been transformed into, in my case, Katie Price’s 2014 barnstormer Make My Wish Come True. Your task is to help the book remember what it’s like to be human by doing increasingly creative things to it. Drawing in it, describing things you’ve lost, cutting up paragraphs and sticking them back together in a different order, crossing out all the words on a page except the ones that you like… even giving your book a face. But through every stage, you also have to tear pages out and shred them, sometimes three or four times, before you can progress to the next part. Being asked to repeatedly destroy bits of a book was a strange thing. At first I really didn’t want to. Ripping out pages of a book felt wrong. It felt transgressive and savage. Even Katie Price’s Make My Wish Come True, which I’m sure is very good, but equally sure isn’t winning a Nobel Prize any time soon. Ali said that he thinks it’s because books are filled with magic and imagination; writing comes from the soul so when we tear up a page of a book we feel like we’re tearing up part of that soul. But that’s what made the concept interesting to him. “It’s just an object. There are thousands of duplicates of the words you tear up all over the world. And what’s the difference between words that you destroy and words that you will never read?” That’s probably one to ask our Matt. I asked Ali if he had any favourite or least favourite teachers at our school. He, evidently a kinder person than I, only listed favourites: Mr. Streeton opened his eyes to the bigger questions of History; Mr. Shelton went the extra mile to help him prepare for maths exams; Mme. Cooper pushed them very hard in French because she saw potential in the class, and he has a lot of respect for that. As I played The Book Ritual, I began to really relish tearing out the pages. The physical act — the papery resistance before the book gave one up, and the noise of the shredder, and the heap of word spaghetti growing ever higher on the show floor — became more and more satisfying. But because it was a show floor, other people had been playing first. I picked up one of the other books and flicked through it. 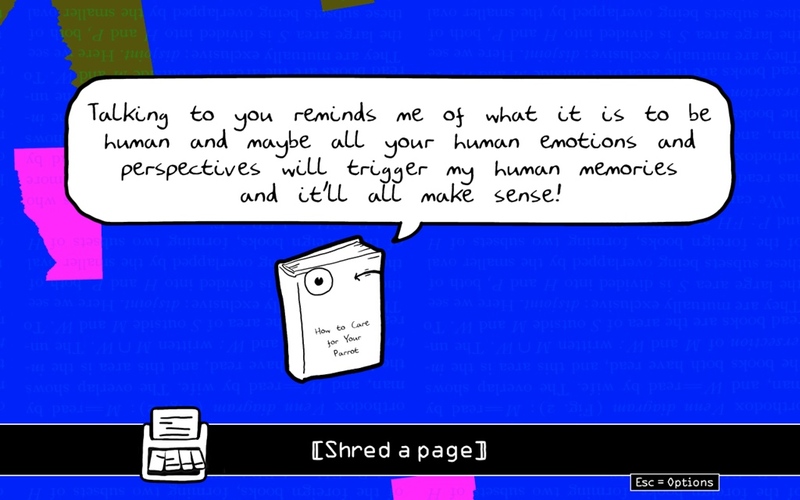 One of the things the game asks is for you to write down something you lost, and how you felt about it, in the pages of your book. Whoever had played that time had written a list of women’s names, and an apology. Ali told me he makes a note not to ask people what they write. The sense of safety you get from knowing the book is private is important in the player being honest with their answers — though he thinks a bigger factor is whether people come in hungry and open to share themselves, or if the game needs to earn their trust first. This, he says, makes them more likely to choose to play the game with a book they actually like. He said something similar when I asked if he remembered his time at our school fondly. Ali said he has lots of great memories and friends who he’s still in touch with, but also remembers being a “total embarrassment”. The social group would sometimes book out a scout club hut overnight. People would make out in shared sleeping bags (mostly, I believe, for warmth, because the hut was unheated) and then be wary of each other the next day. I think Ali thought I played the violin because our friend Tim went out with a girl who played the cello; we looked kind of alike and I also sort-of-dated Tim for a summer. Tagged with EGX 2018, feature, interview, preview, The Book Ritual.